Wow, I cannot believe that it's the end of July! This was one of those months that seemed very long - I guess that means it was pretty busy. 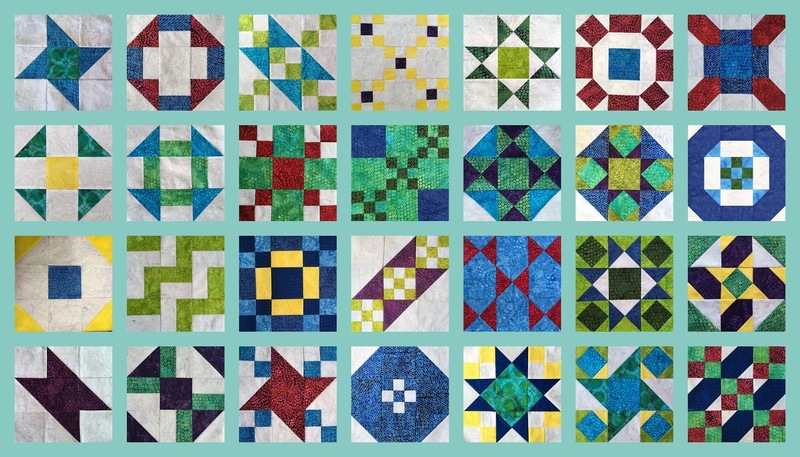 I don't have a new block for you this week for the Quilter's Recipe Box, but I do have a project that grew out of my block of the month series! 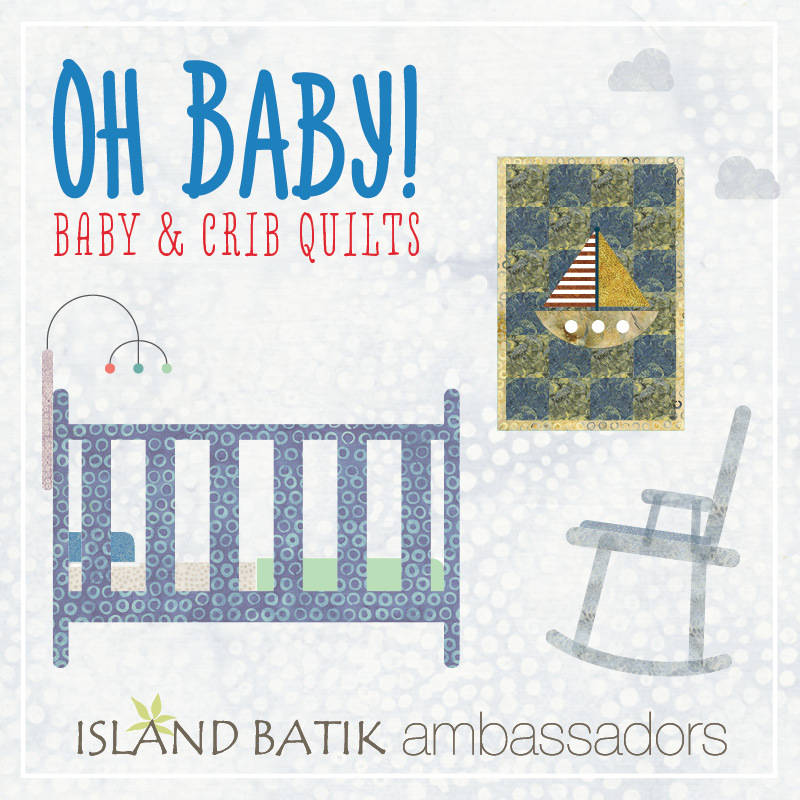 This quilt was inspired by my Twinkle Star post, and created for the Island Batik Ambassador Challenge this month - Oh Baby! I've been sending out teasers on my Instagram and Facebook accounts all week - the fabrics are so pretty! This block uses the Half Square triangle unit, the Split square unit and the nine patch unit. And this one uses the Quarter Square triangle as well as the Four Patch. The fabrics in this quilt are from the Sour Apple and Country Dozen lines. I used leftovers from the quilts I made for Island Batik to display at Spring Market. These fabrics are available for ordering now and will be shipping to your local quilt shops in the next few months, so make sure you tell your shop that you would love them to order these - they are really fun prints! I've been doing a lot of simple quilting lately, so I was on the lookout for a different idea of how to finish this quilt. Well, wouldn't you know it, Angela Walters had a great free motion pattern on her blog this week: Flower Meander! I decided to try it out and see how I liked it. Nice texture! I kept my flowers big and loose and just did a wavy line for my flowers. It was a nice variation on my usual kind of quilting, so it was fun, and I think I will use it on another quilt I want to finish this week. I found this great yellow/orange Aurifil variegated on sale at the quilt shop, and it was nice on this quilt. I'll tell you a secret - the 50 wt thread is so subtle in your quilting that you can use a color that doesn't match exactly and it still looks fantastic on your quilt! I love the way that it just blends in and creates great texture. If you want your quilting to stand out more, use a 40 or even the 28 weight. But if you just want to have beautiful texture, the 50 wt works fantastic every time! Here is the finished quilt, posing with my lovely yellow rose bush - so pretty together! I am really pleased with how this quilt came out - and what a fun way to use some of the blocks from my Quilter's Recipe Box collection. I can't wait to put them together at the end! 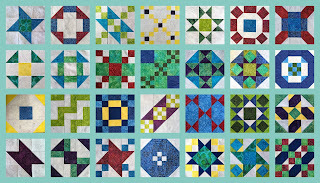 I just love sampler quilts! 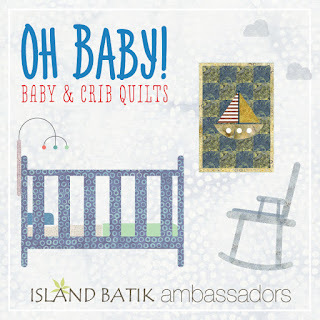 And the surprise is: a new box of fabric from Island Batik! Are you ready for some fun? (I must be because I said that word over and over again!) Here is the video of my live unboxing! Have a great week and join me next Monday for a new Quilter's Recipe Box Unit and block! Sign up for my newsletter and you'll get the link directly to your inbox. The quilt and rosebush are gorgeous, and your video was great!